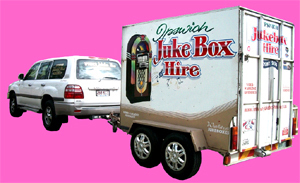 Ipswich Jukebox Hire makes your party "PARTY"
View our new online Ipswich Street Parade Videos. Our business is music, with over 20 years experience we can make your party, Party. 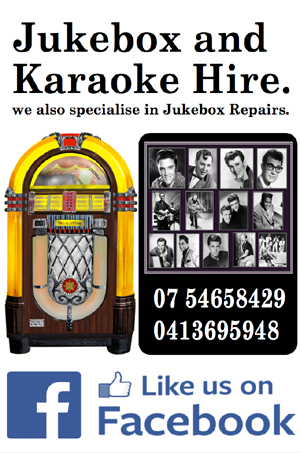 At Ipswich Jukebox Hire we offer a wide range of Jukeboxes including the fabulous classic Wurlitzer and the latest video Karaoke Jukeboxes . 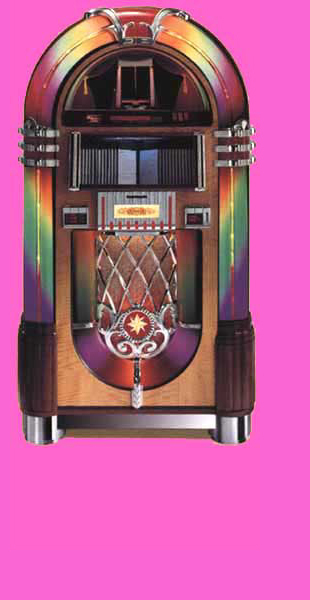 Ipswich Jukebox Hire can supply music for Corporate functions, Weddings, Engagements, to the smallest of parties, we can supply a Jukebox that will cater to all ages and price bracket. Don't get caught hiring inferior machines, get peace of mind talk to Ipswich Jukebox Hire. 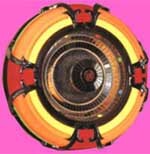 The Real Ipswich Jukebox Hire has a extensive catalogue of music to suit all tastes and styles. Also available for that special affect are fog(*smoke) machines and laser lighting we also have Public Address systems (*PA) for speeches etc all at a very reasonable prices. Imagine your own Disco or Night Club scene with laser lighting and Fog machine and Video Jukeboxes with all the latest Video Clips. At Ipswich Jukebox Hire we cater to our clients taste to achieve the ultimate successful event. Ipswich Jukebox Hire is open seven days a week so why not give us a call and check out our great Jukeboxes and prices, you will be pleasantly surprised . Our prices include GST, Pick up and delivery, Don't worry about picking it up yourself we deliver to your door saving you time and money. Ipswich Jukebox Hire started over 20 years ago by Val Metcalfe, from one classic Jukebox to the highly successful music business it is today. Look out for Val and her team at the Ipswich City Parade, May 5th 2012 where she puts on a fantastic music display. Ipswich Jukebox hire has won the trophy for Best Music Float 2004, 2005 and 2006 in the the Ipswich St Parade with their tribute to Guns N Roses and Motley Crue, Metallica and Billy Idol was the crowd pleaser in 2007. The tribute to Judas Priest 2008 was a hugh success. 2009 saw Val and her team doing Robert Palmer. 2010 Val and her team won the Trophy for best music float for AC/DC the Bon Scott years and Twisted Sister on the 21st of May 2011. Lenny Kravitzat was the man for 2012. Best Music float 2013 for Doc Neeson and the Angles. This year 2014 Val and her team won the trophy for best over all float for their Tribute to Crocodile Dundee and Steve Irwin. With the wonderful support from the public and corporate clients we are forever expanding and keeping up with the latest trends. We add to our CD, Video Karaoke Catalogue monthly so we can supply the latest in music and video.